About a mile from the Vassar campus, an abandoned underwear factory stands as the centerpiece of the planned rebirth of a Poughkeepsie neighborhood. And while doubters may contend it may be difficult, given the current economic climate, to breathe new life into blighted regions of our cities, Elizabeth Celaya ’02 welcomes the challenge. As director of organizational development for the not-for-profit agency Hudson River Housing, Celaya and her colleagues have been accomplishing small miracles along a portion of Poughkeepsie’s Main Street for the past four years. The agency’s “Middle Main” project has transformed several neighborhoods, luring artists, chefs, environmental groups, and others into a once undesirable part of town. Celaya says the project has enjoyed a series of small successes. And while many of the agency’s goals have yet to be reached, city officials and the residents of the area have been encouraged by what they’ve seen so far. Celaya’s next challenge will be transforming the former Poughkeepsie underwear factory into living space on its top floor and restaurants, shops, and artists’ studios on the first and second floors. And in some ways, she notes, public funds are easier to secure for such multiuse ventures. Hudson River Housing is also receiving support from nongovernment sources, such as Hudson River Sloop Clearwater, an environmental group founded by folk singer Pete Seeger, and from Celaya’s alma mater—“Vassar’s Buildings and Grounds sends over some shovels and rakes every time we have a community cleanup,” she says. Vassar students regularly enroll as interns at Hudson River Housing through the college’s Field Work Program, and professors often assign students to help the agency analyze and evaluate its work. During the spring semester, geography professor Mary Ann Cunningham’s class assessed the sustainability of Middle Main and other urban-renewal projects, while sociology professor Leonard Nevarez’s students conducted resident surveys in Middle Main neighborhoods. She expects the organization’s Middle Main project to keep her (and Vassar students) busy for years to come. Celaya, who was born in Poughkeepsie and grew up about 15 miles away, began her college career at the University of Rochester before transferring to Vassar at the start of her junior year. A Field Work placement in a Poughkeepsie women’s shelter convinced her she should stay in the area, and about a year after she graduated, she landed a job at Hudson River Housing. “I wasn’t one of those kids who always knew what they wanted to be when they grew up, but I know now,” she says. 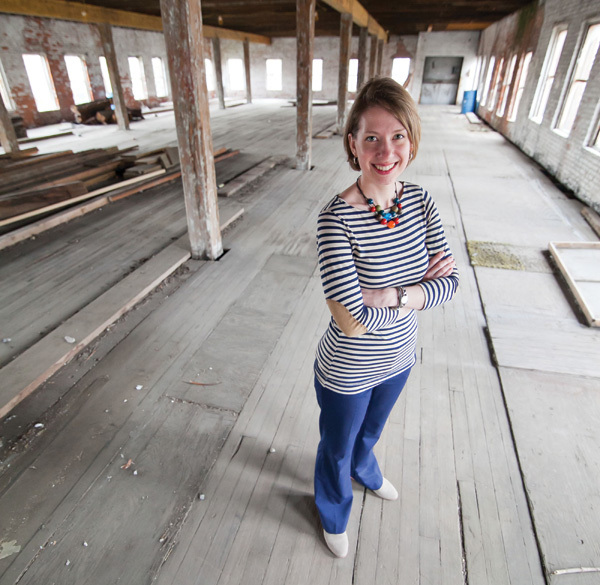 Elizabeth Celaya ’02 inside the former Poughkeepsie Underwear Factory, a 150-year-old Poughkeepsie building recently acquired by Hudson River Housing, Inc. Guest editor Darra Goldstein ’73, the founder of Gastronomica: The Journal of Food and Culture, presents alumnae/i chefs, cookbook authors, thought leaders, and activists who celebrate the intellectual and gustatory pleasures of food (and drink). Television hosts, chefs, and food adventurers Anthony Bourdain ’77 and Andrew Zimmern ’84 sat down to talk about food, their work, travel, fatherhood, and more for this <em>DeltaSky</em> magazine article. Abby Kinchy ’96 reveals the implications of genetically modified seeds. Photographer Todd Shapera '79 contributes a photo essay on cultivating cacao in Belize. Where in the World Are the Vassar Foodies? Sarah Palermo ’06 had a great idea. Why not find out where Vassar’s alumnae/i chefs and alumnae/i-owned restaurants and catering businesses are? The result was this interactive map. But this is just the beginning. We know there are plenty more of you out there and we want to hear from you!